A message went viral on various groups of social media that two terrorists entered in the Sikar Bus station, Rajasthan and killed one citizen. It’s all started again under the rule of Congress. The two different videos are viral on various social media platforms . Translation: Two terrorists entered in the Sikar Bus station, Rajasthan and killed one citizen. It’s all started again under the rule of Congress. The message was shared by many people across all the social media platforms. It’s true that the video is from Sikar, both videos are of the same event but taken by two men standing at different places i.e. different angles. The viral videos does not depict any kind of terror attack on Sikar Bus stop, Rajasthan. In fact, the videos are taken during the mock drill done by Rajasthan police. There are several similarities in the two videos which are as per mentioned below. The uniform of the police force is also the same in both videos. 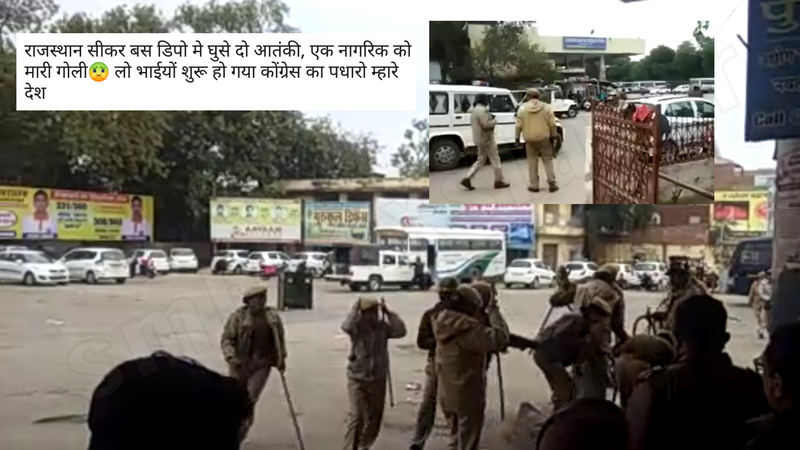 Both videos appear on social media platform on January 31, 2019, when Rajasthan police did the mock drill. The same police van is seen entering the bus depot in both the videos. The timing between 3 shots in both videos is similar as the first two shots were fired with a difference of two seconds while the third shot was fired with a difference of four seconds. On contacting, Rajasthan police also confirmed to SMHoaxSlayer that both the viral videos are taken during the mock drill done by Rajasthan police on January 31, 2019. It was a drill, not any terrorist attack. SP, Collector, Local SHO, medical team all were there for the drill. Media website likes www.Bhaskar.com and www.Patrika.com also reported the incident of police mock drill. The Rajasthan police did moke drill at Sikar Bus depot on Thursday afternoon. Three terrorists started firing on the ticket counter while chanting the slogans like “Kashmir is ours, we will take it back.” Depo Police station in charge Bhola Singh tried to catch them as soon as he heard the sounds of firings. Both the terrorist threated Bhola Singh with the rifle pointing at him while running towards old building. The control got the news at that moment. The terrorist did four blasts and four rounds of firing at the depot. The QRT team and special commando forces with the police force of Kotwali and Udhyog Nagar police station reached the depot as soon as they got the information. The mock drill was done on Thursday afternoon in the Roadways bus depot by the police. Three terrorists raised slogans of Kashmir is ours and we will take it and started firing near the ticket counter. Dipo station’s in-charge Bhopal Singh heard the firing and ran to catch the terrorists by holding. When they tried to capture two terrorists in the depot premises, both of them entered the old building of the depot while pushing them and threatening to shoot a rifle. Only then, the information about the firing of terrorists was given to the control room. The terrorists carried out four bomb blasts and fired four rounds in the depot premises. On the information of the terrorists entering the depot, the QRT team, commandos, special squad, and a team of Kotwali and Udyog Nagar’s police station reached the scene. CO City, Girdhari Lal Sharma took charge of the situation and pushed the civilians back before starting the operation. In the depot, SP Dr. Amandeep Singh Kapoor, Collector Naresh Kumar Thakral and ASP Dr. Tejpal Singh also reached. After about 45 minutes, the police entered the building and killed two terrorists in the encounter and arrested a terrorist. Later, when people came to know that the police had a mock drill for training, they got a sigh of relief. A large number of QRT commandos reached after information about terrorists was transmitted from the police control room. Commandos made iron armor to protect against terrorists. All the commandos took their positions. Dr. Tejpal Singh continued with the commandos. Hiding, the commandos reached the old building one by one. After getting the locations of the terrorists, the commandos entered the building. 8 rounds were fired from both sides. Commandos and police team killed two terrorists in an encounter. A terrorist was caught alive by the police. Two ambulances and fire brigade reached: On the information of the terrorists being intercepted at the depot, two ambulances reached the spot shortly. The doctor and compounder were also called from SK Hospital. The fire brigade also reached the scene. After the operation was over, the three people the ambulance were taken to the hospital by ambulance. Seeing the terrorists in the depot, there was chaos amongst the passengers. The RAC team kept pushing people back from the depot. RAC made a big circle using the path. During this, the information of the terrorists entering the city became viral. People in the depot were calling others they know to seek information. An injured terrorist was brought to the hospital from the ambulance for treatment. The terrorist was in the trauma centre. There was no policeman present there. The terrorists escaped from Trauma centre. Later, after receiving information about the arrival of police officers, he was called back. At the same time, an ambulance was inquired as oxygen cylinder was not there. The policeman brought the body of both the terrorists on the stretcher and brought the third one alive. The people present in the depot did not understand anything. People thought the action was real and started chanting slogans of Bharat Mata. They appreciated the police work. ← Viral Images of Ganga river has photos wrongly captioned. September 6, 2018 Hoax Slayer Comments Off on Did Rahul Gandhi use a photo of lake Rakshas Tal from Google ?